That dream, however, was brought back to life around Easter 2016 (I have only just realised the resurrection theme, apologies!) when on a trip to Chester I stumbled upon a branch of Abakhan’s. inside that branch of Abakhans was a special bolt of cotton lawn. It wasn’t Liberty or anything like that, but it was on sale at just 99p per metre. The price was the only thing that caught my eye. 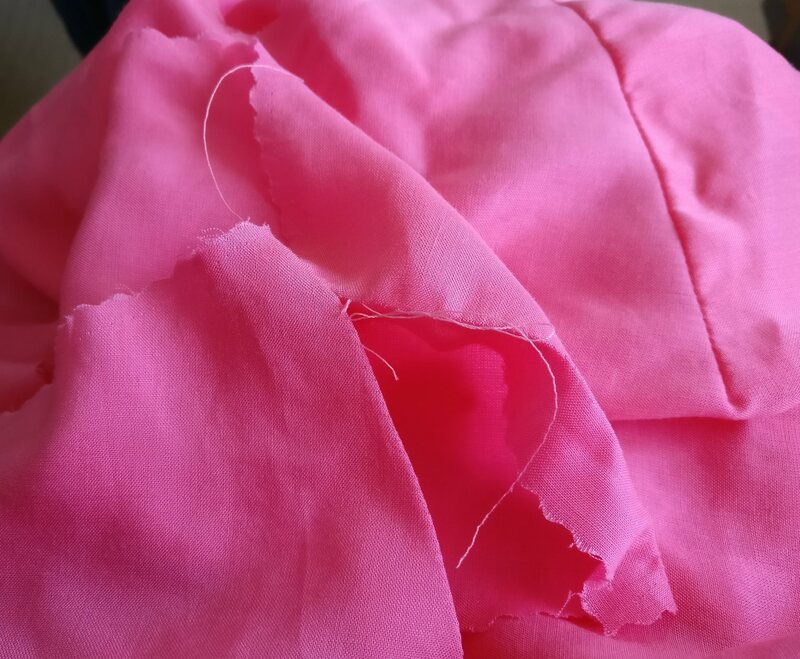 Let’s be honest here, I can’t abide bright pink, and this is about my least favourite shade, but that said, it was only 99p per metre! 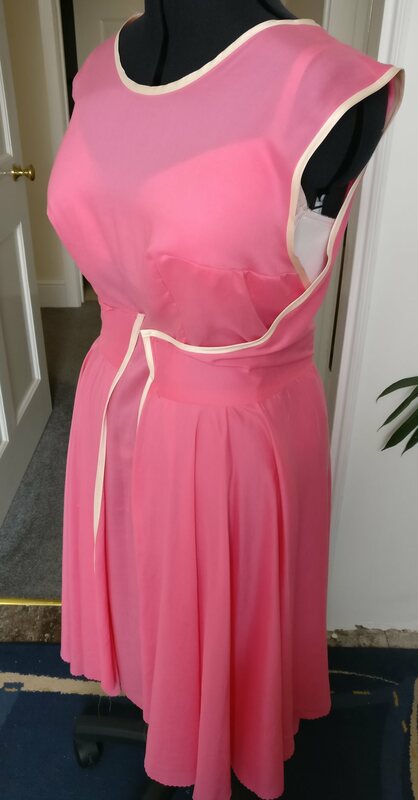 For the walkaway dress that I knew I wasn’t going to ever wear, that needs 5.5m of fabric less than 5.50p seemed like a very good price to pay. Especially as it has a beautifully soft hand, and my daughter loves this shade of pink as much as I dislike it. With that fact in mind, I bought 6m (yes, I splurged a whole 50p and bought an extra 0.5m ) with the plan of making the walkaway dress and then almost immediately unpicking it, to make some things for my daughter out of the fabric pieces. This fabric made it into the Use 5 2017 line-up for several reasons; the cost of it wasn’t a factor, but the sheer amount of space it was taking up in my stash drawer, and the fact that I want to make some items for my daughter out of the fabric before she gets too big or decides she doesn’t like pink meant that I wanted to sew it up ASAP. The fear factor here was that I didn’t know how to get the dress to properly fit. 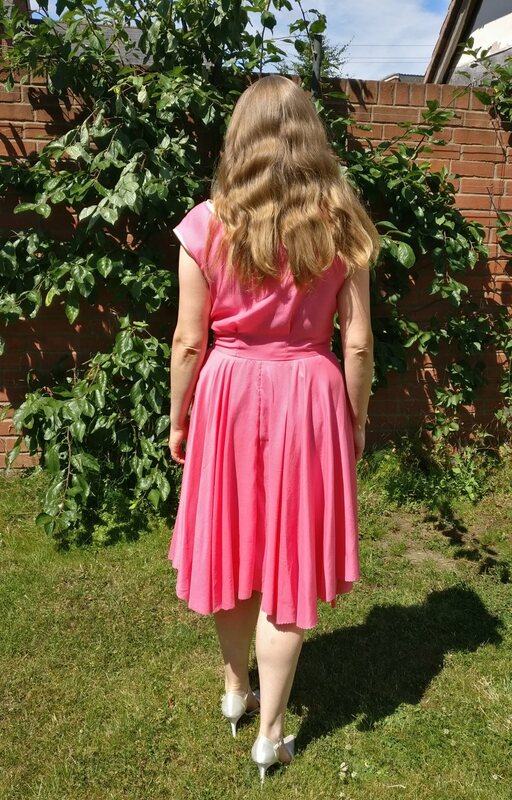 You can see from the photo below that there is a rather unsightly bulge at the front of the dress – I’m not sure why the fabric does this, but I couldn’t seem to stop it in wear, and pulling down the underskirt wasn’t flattering! 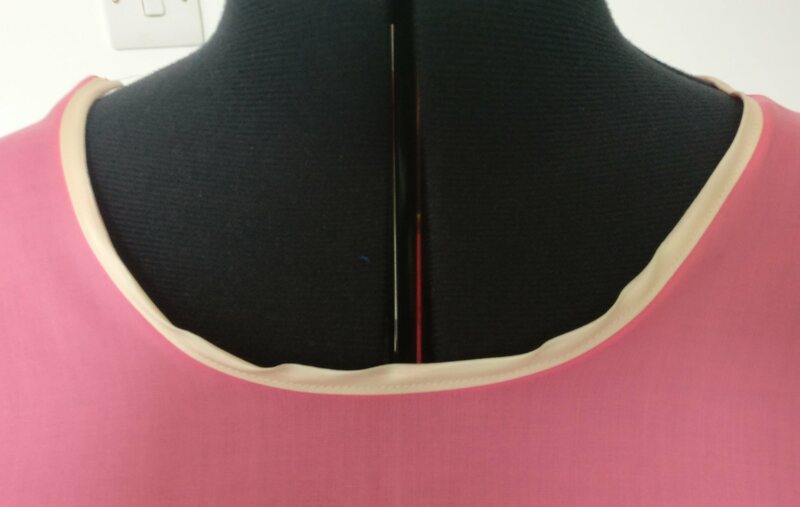 The pattern was straightforward to follow, although I had absolutely no idea how to alter it to get it to fit me from the flat pattern – normally I can measure pattern pieces and dimensions on the pattern to get a rough idea of fit, but this was so unusual in construction that I didn’t know where to start. You can see on some of the pictures that the bust point on the dress is rather higher than mine (curses!) , but other than that the fit is pretty good. I did sew the fisheye darts at the front slightly deeper than marked on the pattern, but not much. 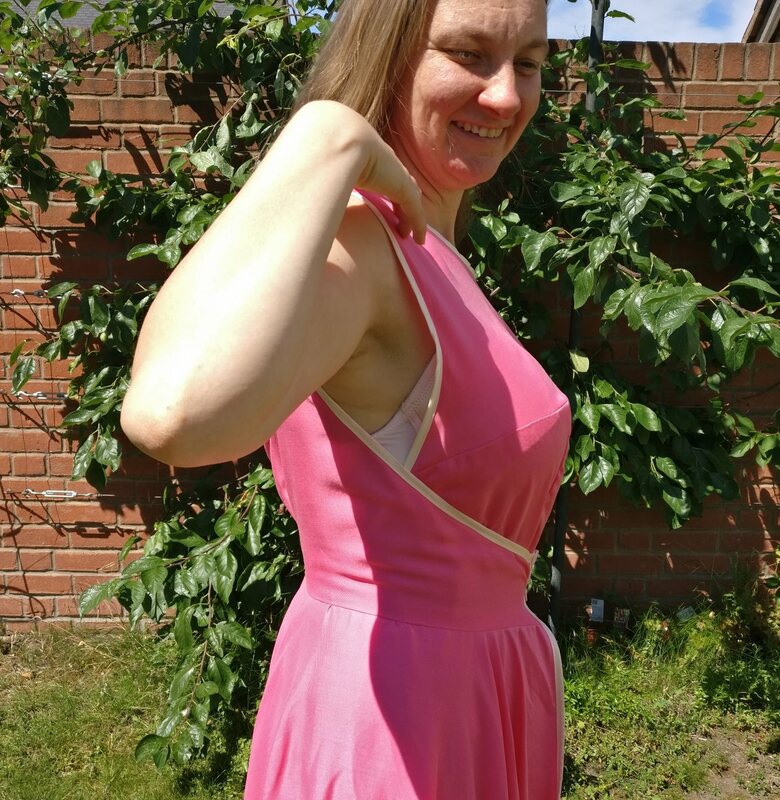 I also tried to cut the front and back armscye curves slightly more shallow than drafted in the hope of covering up a little bit more of the bra than otherwise. This worked to an extent, but the bra is still on show, making this unwearable for me unfortunately. As explained here I have a thing about my bra being on show! 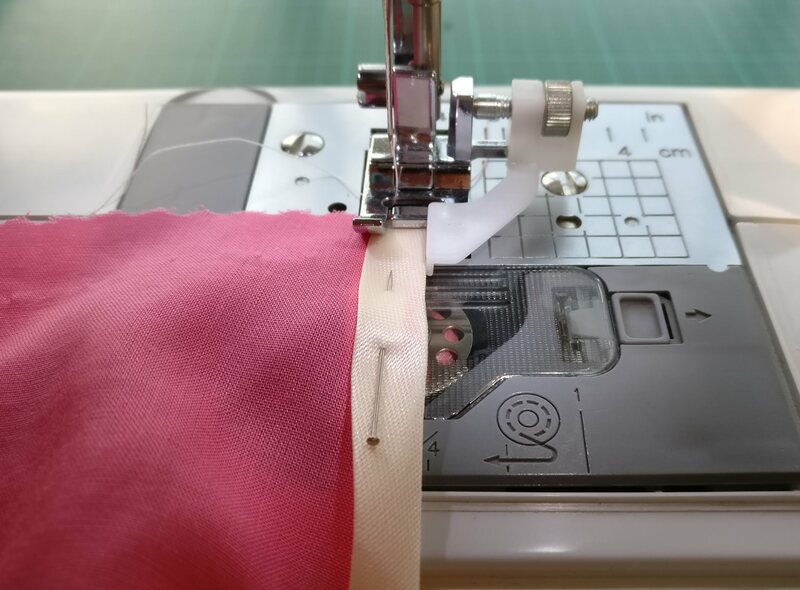 I think the only difficulty I had was applying the bias binding; unfortunately the material for the binding was a little too stiff and heavy for the light cotton lawn, which meant that rather than conforming to the curve it pulled at the lawn, trying to force it straight. Additionally, I had forgotten to press the binding to the required curve before sewing it, so all in all, I’m surprised it came out this well! This is a lesson learned for the future though; bias binding weight, like interfacing, needs to match the weight of the fabric and press the binding to approximately the correct curve before attaching it 🙂 I used a foot with a “fence” in order to ensure that the stitching remained a consistent distance from the edge of the binding – another foot from my purchase last year used. This dress took me an age to complete, although it really shouldn’t have done. 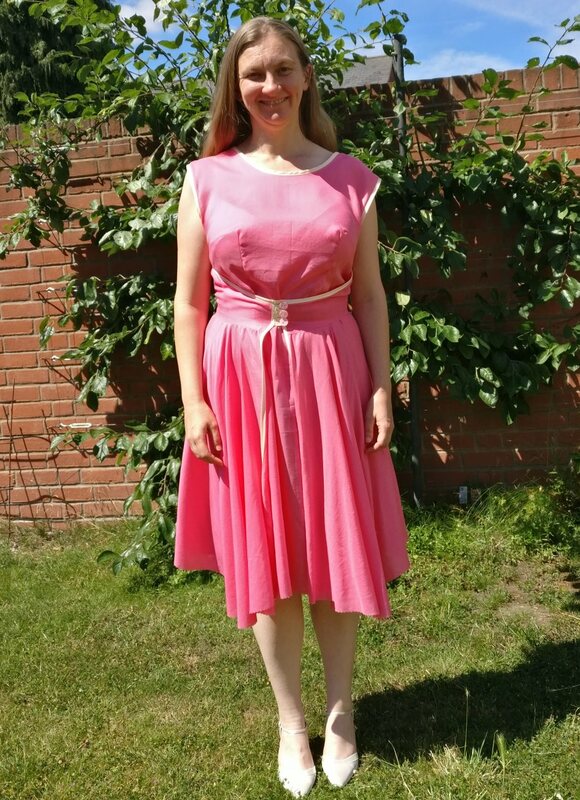 I left it half finished to allow the circle skirt to “rest” before cutting it to length and then hemming it – once the dress was up on my dress form, I’m afraid it stayed there for a very long time! Walkaway Dress Hanging on Mimi for Months! About 2 months later though it dawned on me that I had already achieved my aim of learning from the construction – I know how to hem things, and I know that hemming a circle skirt takes forever, I also knew that I didn’t want to cut into the pieces any more than necessary, as I want to use the fabric for some things for my daughter – I’d be really miffed if I ended up giving her pedal-pusher length pyjama bottoms just because I’d straightened up the hem on a dress I didn’t want! As you can see, the finished item isn’t quite as finished as most versions. I am relieved to find that this shape, as expected, doesn’t suit my figure. I would have been quite upset if I’d made it in fabric I didn’t like only to go and remake it in nice fabric – although I suppose that’s a toile and many people do that, I just avoid it wherever possible! Here is one final view of the dress as it is now – mostly unpicked!